UNLV almost rallied all the way down from 14 points Saturday, but a late steal preserved Illinois’ 77-74 victory at State Farm Center. Joel Ntambwe led the Rebels with 18 points. 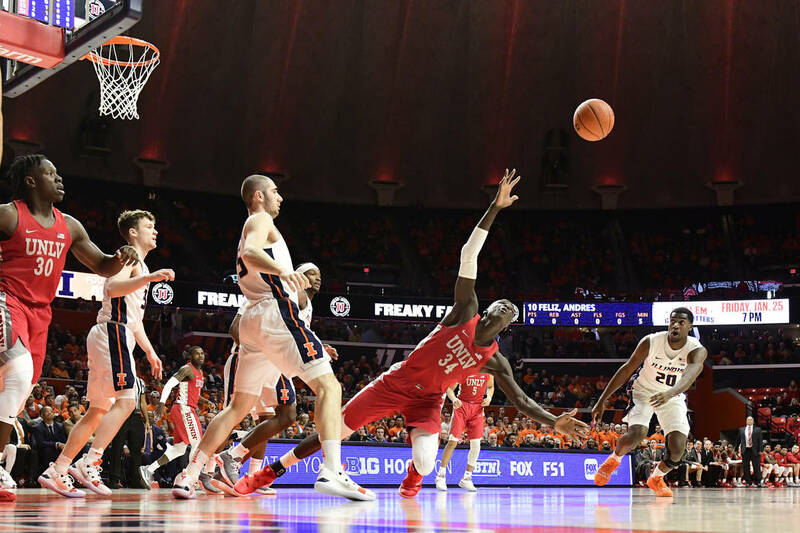 CHAMPAIGN, Ill. — Amauri Hardy was behind the 3-point arc when he leaped to take what could have been the tying shot, one that would have rallied UNLV all the way back from a 14-point second-half deficit. Hardy, though, had Illinois guard Ayo Dosunmu all over him and, caught in the air, tried to pass. The ball went right to Andres Feliz with two seconds left, preserving the Illini’s 77-74 victory Saturday at State Farm Center. UNLV (4-4) has lost three consecutive games. The Rebels next play Brigham Young on Saturday at T-Mobile Arena. They appeared well out of the game with Illinois (3-7), trailing 61-47 with 8:23 left, but then got help from an unlikely offensive source in freshman forward Joel Ntambwe. He scored nine points in the final 4:22 and finished with 18 points; his previous high was seven points twice. UNLV twice cut the Illini’s deficit to two points in the final 27 seconds. Dosunmu had the chance to put away the game with 13 seconds left, but missed the first of two free throws. He made the second for a three-point spread. But Dosunmu made up for the missed foul shot with his defense that led to Hardy’s errant pass. “They probably scouted that play, the late-game plays, so they probably knew what was coming at that point,” Hardy said. In the end, the Rebels couldn’t quite dig themselves out of what was a deficit for most of the game. They led for 1:10 in the first couple of minutes after tipoff. UNLV again struggled to shoot, making 33.8 percent of its shots that included 25 percent on 3-point attempts. The Rebels’ 17 turnovers also didn’t help. That’s why Menzies didn’t want to make too big a deal of Hardy’s play at the end. The Rebels had other plays — missed layups, poor passes — that could have made the difference in a one-possession game.